What happens when you combine yolks from pastured eggs with Mark Sisson’s Primal Kitchen Avocado Oil Mayo and Loren Cordain’s recipe for Dijon-style Mustard? You get the best deviled eggs ever! Thank you Mark Sisson and Loren Cordain! We all thank you! Step 1: Make Loren Cordain’s Dijon mustard. This recipe will make extra that you can use as a glaze for salmon, when making homemade dressing or as a dip for veggies. Combine all ingredients in a blender such as a Vitamix or a NutriBullet cup except for the water. Blend until all ingredients are incorporated and smooth. Add the additional water, if needed for desired consistency. Chill for 2-3 hours to meld flavors. NOTE: This method works well for fresh eggs that are usually hard to peel when hard boiled. If your eggs are several weeks old you can skip the ice water bath. Peel eggs and carefully slice each in half lengthwise. Use a spoon to scoop out the yolks and place yolks in a small mixing bowl. 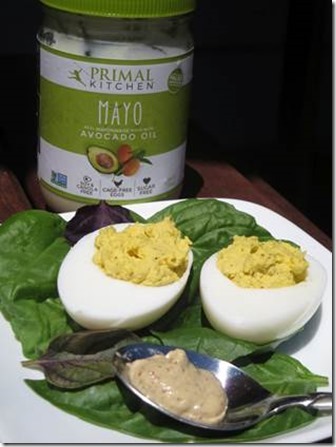 Add 1-2 tablespoons of Mayo and 1-2 tablespoons Dijon-style mustard to the yolks. Mix well using a fork to mash the yolks. 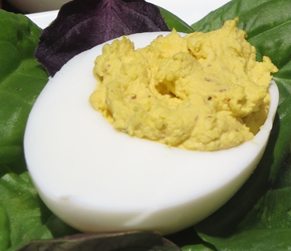 Taste and adjust the yolk filling with additional mayo and/or mustard based on your taste and consistency preference. Place a spoonful to yolk mixture in each empty egg white. Garnish with black pepper and salt, if desired. Serve on a bed of fresh basil. NOTE: best when made ahead of time and chilled for 2-3 hours before serving. 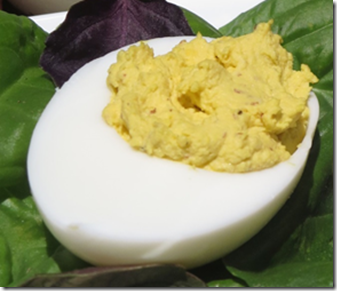 Please comment below about what you think of these Paleo/Primal-style deviled eggs. Such a great idea to use a better quality mayo!